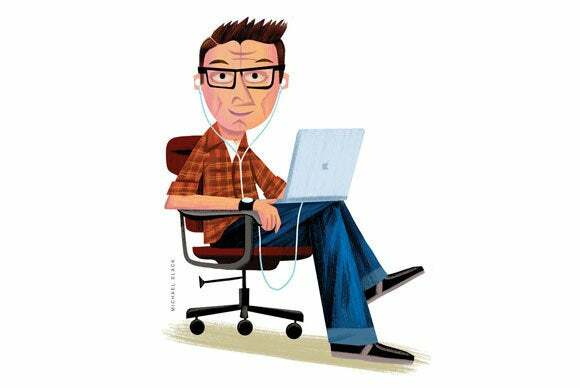 In this week’s column, I look at some interesting questions about getting apps for iOS devices that aren’t using iOS 7, about viewing album art in playlists on iTunes, and about keeping certain tracks from rearing their heads when you’re listening in shuffle mode. I also explain how to set up smart playlists to sort your music by the first letter of artists’ names. Q: I have an iPad 2 that I don't want to upgrade to iOS 7 because it would be too slow. My wife has an iPhone 4 that she is keeping on iOS 6 for the same reason. When we go to iTunes, it shows us apps that are incompatible with these devices. Is there any way I can get the older versions of apps if I need them? The iTunes Store will allow you to download the “latest compatible version” of an app that you have previously purchased, as long as the developer has kept it available in the iTunes Store. To get these versions, go to the Purchased list in either the App Store app on iOS, or in the iTunes Store in iTunes. Select the app you want, then click Download. If the compatible version is still available, you’ll be asked to confirm that you want to download it, and you’ll get that version, not the current one. Q: I put a lot of effort into making sure that I have high-quality album art for all of my tracks, which I want to see in all of my playlists. iTunes defaults to not showing album art for new playlists and I haven’t been able to figure out how to change this. It’s pretty frustrating to have to manually set this for each playlist. Am I missing something obvious? 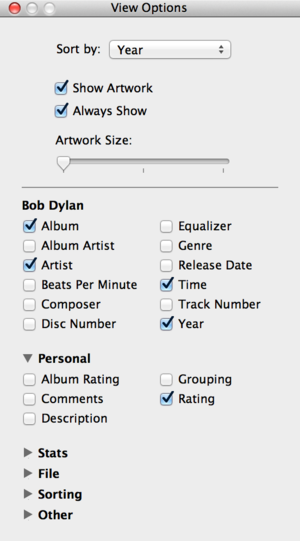 The View Options window lets you choose what displays in your playlists, or in your iTunes library. Alas, no. However, it’s worth pointing out that you can display album artwork in playlists, which many people don’t know. To do this, select a playlist, then press Command-J, or choose View > Show View Options. You’ll see a floating window which lets you choose which columns to view in a playlist, but also gives you the option to show artwork, to always show it, and to choose its size. When you turn on artwork, you’ll see it displayed at the left of the window. You can resize its column—which also shows the name of the album the song is part of —by dragging the column divider to the left to only show the artwork. Q: I want to shuffle all my music but I keep getting my stand-up comedy recordings in the mix. Is there a way to keep these on my iPhone but not have them played in shuffle mode? iTunes has a convenient tag you can set to prevent both iTunes and iOS devices from playing certain tracks when in shuffle mode. Select the tracks you want skipped, press Command-I, then click the Options tab. 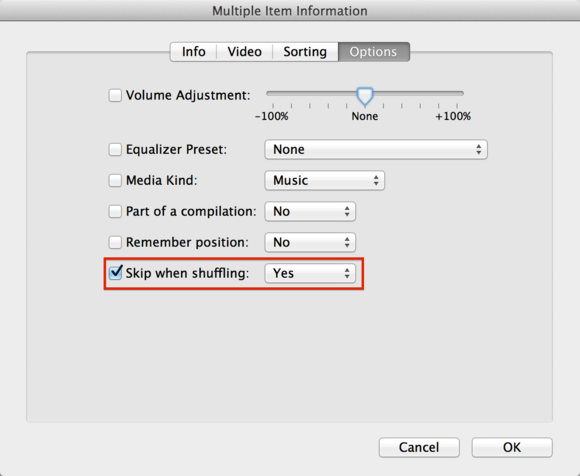 Click the popup menu next to Skip when Shuffling and set it to Yes. Click OK. This setting tells iTunes and the iOS Music app to ignore tracks when playing in shuffle mode. You should be aware that if you set tracks to skip when shuffling, they won’t come up in any smart playlists you create that are set to play in shuffle mode. Also, iTunes doesn’t take this tag into account when you press Option-space to start playing your iTunes library in Genius Shuffle mode. Tracks set to be skipped will be played in this mode (though I certainly think this should not be the case). Q: I have a Volkswagon audio system, which gives me limited options to browse my music. I can only choose to browse by Playlists, Artists, or Songs. Also, there’s only a single scrolling button, since the iPhone screen isn’t accessible when it’s connected. It takes a long time to scroll through the Artist list. Is there any way to create playlists to separate artists alphabetically so it’s easier to find who I’m looking for? Yes, you can do this with smart playlists. It will take a bit of work to set up, but after that, it just runs on its own. Create a new smart playlist: press Command-Option-N, or choose File > New > Smart Playlist. In the first condition, choose Artist begins with, then enter the letter A in the text field. iTunes will try to auto-complete that with the first artist whose name starts with A, so just delete the rest of the text. If you want to have one playlist per letter, you can save this now by clicking OK. Name it something like Artists A. But it might be easier to have several letters in each playlist; for example, you could set this one up to include artists whose names begin with A, B or C. To do this, click the plus (+) icon to the right of the first condition, then create a second condition where Artist begins with B. Do the same again, with Artist begins with C.
You can make smart playlists to sort your music by the first letter of artists’ names. What’s great about this method—using smart playlists—is that they’ll always be up to date (as long as Live Updating is checked, at the bottom of the playlist window). So whenever you add new music to your iPhone, you’ll find it in these artist playlists. If you don’t sync your entire music library and all its playlists, make sure to sync these to your iPhone.